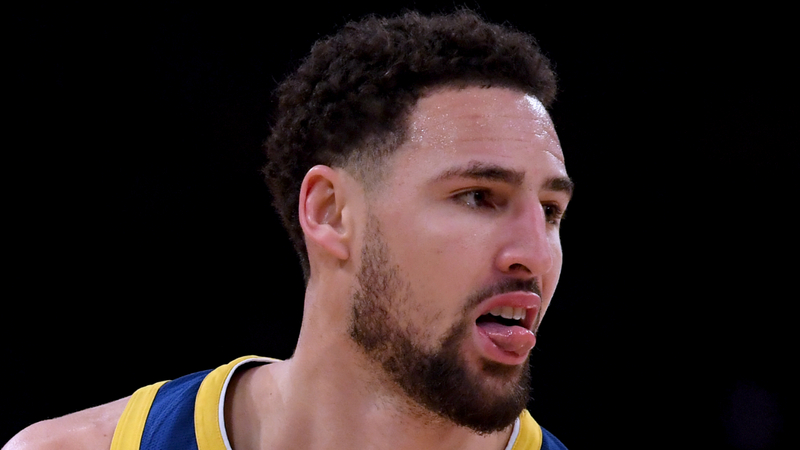 Klay Thompson described his record-breaking efforts in the Golden State Warriors' 130-111 triumph over the Los Angeles Lakers as "just one of those nights". The superstar shooting guard drained his first 10 three-point attempts at the Staples Center, the first time a player has achieved such a feat in the NBA. Thompson did not miss from beyond the arc until there was just three minutes and 55 seconds to play in the third quarter. In October, the four-time All-Star set the benchmark for most three-pointers made in a single game when he nailed 14 against the Chicago Bulls and Thompson reflected on another night to remember. "It just happened to be one of those nights," Thompson said, in quotes reported by ESPN. "It was the best percentage I ever shot. But it just happened to be one of those nights, man. It's hard to explain." Thompson finished with 44 points, with 23 of those coming in a third-quarter blitz, and head coach Steve Kerr hailed the 28-year-old's performance. "Klay does that five or six times a season," Kerr said. "You guys have seen it. He just got red hot, white hot." The Warriors were blown away by the Lakers 127-101 on Christmas Day and Thompson believes the memories of that defeat played a part against Los Angeles, who were without LeBron James, Lonzo Ball and Rajon Rondo. "It definitely had an effect," Thompson said. "One thing about this game is we play these guys four times. "You do have to have a short memory because it's such a long season but when it's a beatdown like that, you're going to remember it."